The transcription factor Helios has been reported to be a marker of regulatory T cells (Treg) of thymic origin, distinguishing them from Treg induced in the periphery (iTreg). In this study, we demonstrate Helios expression in Foxp3+ iTreg, both in vitro and in vivo. Following i.v. peptide injection, in vivo Helios expression in adoptively transferred TCR transgenic T cells was more rapid than Foxp3 induction but less stable at later time points without a second injection of peptide. Our in vitro data suggest that APC influence Helios expression in a manner distinct from stimuli required for Foxp3 induction. Thus, Helios expression in iTreg may reflect the context of stimulation during Foxp3 induction. In summary, the robust Helios expression we observe in iTreg precludes its use as a marker of thymic Treg. Expression of the transcription factor Foxp3 is required for the development, maintenance, and suppressive function of regulatory T cells (Treg) (1, 2). Although most Treg begin expressing Foxp3 during thymic selection, a subset known as induced Treg (iTreg) leave the thymus as CD4+Foxp3− T cells and begin to express Foxp3 upon encounter of Ag in the periphery (3). Weak TCR stimulation often results in Foxp3 induction, although increased concentrations of TGF-β may allow for Foxp3 induction when Ag density or potency is otherwise too high (4). Although peripheral induction of Foxp3 has been demonstrated in a variety of experimental systems, the absence of a specific marker for iTreg has made it difficult to assess their role in homeostasis and importance during physiological immune responses. Recently, it has been suggested that expression of the transcription factor Helios differentiates thymic-derived Treg from those induced in the periphery (5). Helios is a member of the Ikaros family of transcription factors, whose five members contain conserved C-terminal zinc finger motifs, which allow homodimeric or heterodimeric interactions between family members (6, 7). Through such dimerization, Helios may alter the function of Ikaros (8–10), which has been reported to influence T helper differentiation (11–13). In the steady state, Helios expression is largely restricted to Foxp3+ Treg (5, 14–16). Recent reports have demonstrated Helios upregulation in both CD4 and CD8 T cell subsets upon stimulation, independent of Foxp3 expression (17, 18), and have also shown expression of Helios in Treg induced in vitro (18, 19). These findings raise concerns regarding the use of Helios as a marker to distinguish thymic-derived Treg from iTreg. Using an Ag-specific system, we show expression of Helios in iTreg induced in vivo and characterize the kinetics of this expression. A single low dose of high-affinity peptide, previously described to induce Foxp3 expression in a population of adoptively transferred naive 5C.C7 TCR transgenic cells (20), triggers Helios expression in the resulting in vivo iTreg. Time-course experiments reveal that after TCR stimulation, Helios expression precedes Foxp3, but that the levels of Helios expression are less stable in the absence of continued exposure to Ag. Our in vitro data suggest that APC influence Helios expression independently of Foxp3 induction, potentially reconciling the differences between our in vivo system and those published previously (5). In summary, although iTreg induced under some conditions may lack Helios, it clearly can be expressed in Foxp3+ Treg induced in vivo, and this precludes its use as a marker of thymic Treg. 5C.C7 TCR transgenic RAG2−/− CD45.1 mice were used as donor mice in adoptive transfer experiments, as described previously (20). Male B10.A mice, purchased from Taconic, were used as adoptive transfer recipients at between 6 and 9 wk of age. All mice were maintained in microisolator cages and treated in accordance with the regulations of the National Institutes of Health and the American Association of Laboratory Animal Care. Experiments in this study were approved by the Memorial Sloan-Kettering Cancer Center Institutional Animal Care and Use Committee. Moth cytochrome c (MCC 88-103) peptide was synthesized and HPLC purified (≥95%) by Biosynthesis (Lewisville, TX). Cells were cultured in a 37°C humidified chamber with 5% CO2 in complete RPMI 1640 medium (supplemented with 10% FCS, 2 μM glutamine, 100 U/ml penicillin and streptomycin, and 2 μM 2-ME). Single-cell suspensions were prepared from lymph nodes (LN) harvested from 5C.C7 RAG2−/− mice (routinely >90% Vαll+Vβ3+ by flow cytometry) and stimulated in duplicate in 96-well round bottom plates. A total of 1 × 105 5C.C7 T cells were cultured with either plate-bound anti-CD3 (clone 500-A2), with or without anti-CD28 (clone 37.N), or with 4 × 105 irradiated T-depleted splenocytes and either anti-CD3 or MCC peptide. MCC and anti-CD3 were titrated in each experiment as the optimal doses for Foxp3 induction vary among experiments; the doses shown are 0.1 μg/ml for plate-bound anti-CD3, 0.02 μg/ml for anti-CD3 with APCs, and 1 nM MCC. In addition, in vitro assays included 100 U/ml recombinant human IL-2 (PeproTech) and 5 ng/ml TGF-β1 (PeproTech). Cells were cultured for 90–96 h before cells were stained for flow cytometry analysis. Abs to surface markers were from BD Pharmingen, eBioscience, or BioLegend. Foxp3 (clone FJK-16s; eBioscience) and Helios (clone 22F6; BioLegend) were detected after fixation and permeabilization with eBioscience reagents. Flow cytometry was done on a BD LSRII. Data were analyzed using FlowJo version 8.8.6 and further processed using Prism 5.0 (GraphPad Software). Between 5 × 105 and 1 × 106 5C.C7 RAG2−/− CD45.1 T cells were transferred into B10.A recipients by tail vein injection. Mice were subsequently injected i.v. with 0.2 μg MCC peptide diluted in PBS. In some experiments, a second injection of MCC peptide was administered 14 d after the initial stimulation, as indicated. To enrich for 5C.C7 T cells prior to flow cytometry analysis, CD4+ T cells were purified from LN suspensions by Dynal negative selection (Invitrogen). A previous report demonstrated enrichment of Helios− Treg in the peripheral lymphoid organs, relative to the thymus (5). 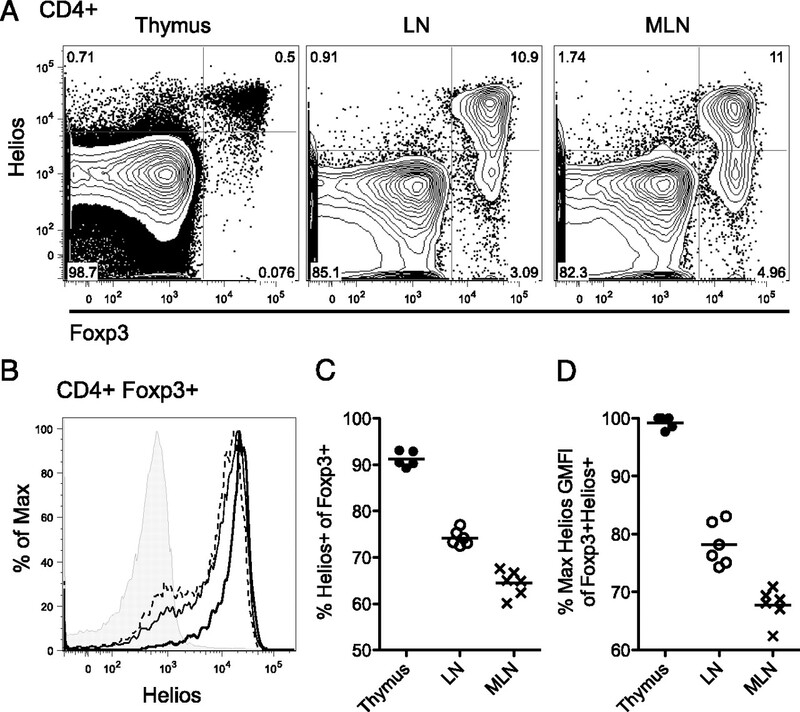 Consistent with this, we found that nearly all Foxp3+ Treg in the thymus of naive wild-type animals express high levels of Helios, whereas ∼70% of Treg found in the peripheral LN and mesenteric LN (MLN) are Helios positive (Fig. 1A, 1C). Of note, in the Helios+ Treg population, the peak of expression is broader and more variable in peripheral Tregs compared with Treg found in the thymus, resulting in lower Helios mean fluorescence intensity (Fig. 1B, 1D). Decreased Helios expression in Treg found in the periphery, compared with the thymus, is consistent with either the possibility that Foxp3+Helios− cells are iTreg (5) or with the recent suggestion that Helios is a marker of T cell activation (18), because the temporal proximity of TCR stimulation is likely to be more variable for Treg in the LN than for those recently selected in the thymus. Treg expression of Helios is lower in the periphery than in the thymus. Endogenous Foxp3+ Treg in wild-type B10.A mice were assessed for Helios expression. 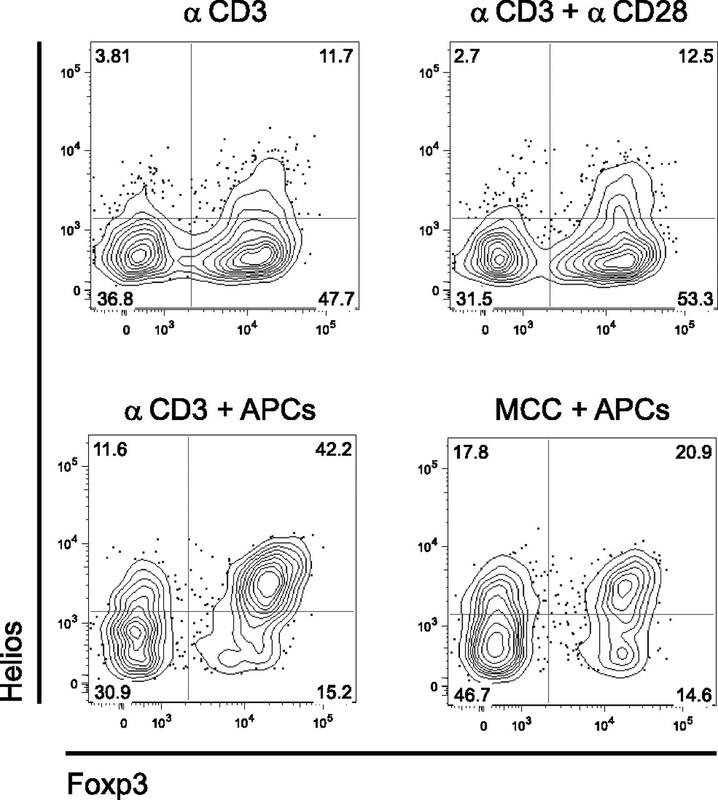 A, Representative flow plots, gated on CD4+ T cells, show the frequency of cells expressing Foxp3 and Helios. B, Overlayed histograms show Helios expression in Foxp3+ CD4 T cells found in the thymus (thick solid line), LN (thin solid line), and MLN (dashed line). The shaded histogram represents the Foxp3− compartment. The frequency of Foxp3+ CD4 T cells expressing Helios (C) and the geometric mean fluorescence intensity (GMFI) of Helios in Helios+Foxp3+ population (D), as normalized to percent maximum, were pooled from three independent experiments. There has been some controversy as to whether iTreg generated in vitro express Helios (5, 18, 19). The minimal requirements for in vitro Foxp3 induction are TCR stimulation and the cytokines IL-2 and TGF-β (4, 21–23). When TCR stimulation is in the form of plate-bound anti-CD3, Helios expression is minimal, despite robust Foxp3 induction (5, 18, 19). However, when Foxp3 is induced using peptide presented by APC, a sizable proportion of the in vitro iTreg are Helios positive (19). Using 5C.C7 TCR transgenic T cells, which recognize MCC peptide in the context of I-Ek (24), we assessed expression of Helios in a variety of culture conditions used to induced expression of Foxp3 in vitro and addressed whether the presence of APC or the type of TCR stimulation was the variable resulting in differential Helios expression in previous reports. We were surprised to find that both anti-CD3 and MCC were similar in their ability to induce Helios and Foxp3 expression when presented by APC (Fig. 2). Thus, the presence of APC enhances Helios expression in iTreg induced in vitro, regardless of the type of TCR stimulation. These data suggest the existence of an APC-specific signal that is important for expression of Helios but not required for Foxp3 induction. APC-specific stimuli distinct from those required for Foxp3 induction enhance expression of Helios in vitro. 5C.C7 RAG2−/− TCR transgenic T cells were stimulated with the indicated combinations of anti-CD3, anti-CD28, MCC peptide, and APCs. After 4 d in culture, cells were stained for Foxp3 and Helios. Data are representative of at least three independent experiments. Although Helios is upregulated in iTreg generated in vitro, previous work has demonstrated that iTreg induced in vivo with oral administration of Ag do not express Helios (5). It was unclear whether all in vivo iTreg lack Helios or whether expression could vary depending on the route of Ag administration. We have previously characterized in vivo Foxp3 induction in adoptively transferred 5C.C7 T cells (20). In this system, 5C.C7 Rag2−/−CD45.1+ T cells are transferred into wild-type B10.A recipients before subsequent i.v. injection of a single dose of MCC peptide. We found that low doses of MCC were most efficient at inducing Foxp3 (20), consistent with previous work demonstrating that weak stimulation favors this process in vivo (25). Thus, using an optimal low dose of MCC peptide (0.2 μg), we induced Foxp3 and assessed Helios expression in 5C.C7 found in the LN 15 d after peptide injection. Adoptively transferred 5C.C7 do not express Foxp3 in the absence of peptide (Fig. 3A), indicating that all Foxp3+ 5C.C7 observed upon in vivo stimulation are not of thymic origin. We found that nearly all Foxp3+ 5C.C7 expressed Helios, with a portion of the Foxp3− 5C.C7 T cells also expressing Helios after stimulation, although at somewhat lower levels (Fig. 3A). This is consistent with a recent report observing that Helios was expressed at lower levels in polyclonal CD4+Foxp3− cells, compared with Treg, and that Helios expression correlated with markers of Ag experience (18). Induced Foxp3+ 5C.C7 had a lower level of Helios than the endogenous LN Treg compartment (Fig. 3B), although the significance of this is unclear, because the function of Helios in Treg is unknown. Foxp3+ 5C.C7 induced in vivo express Helios. Congenically marked 5C.C7 RAG2−/− T cells were adoptively transferred and subsequently stimulated with a single i.v. injection of MCC peptide. Fifteen days later, CD45.1+ LN cells were assessed for expression of Foxp3 and Helios. A, Representative flow plots show the frequency of Foxp3+ and Helios+ 5C.C7, with or without injection of MCC peptide. B, Histograms show Helios expression in induced Foxp3+ 5C.C7 T cells (dashed line), in endogenous Foxp3+ CD4 T cells (solid line), or in total 5C.C7 from naive mice (shaded histogram). Data are representative of at least three independent experiments. To better characterize the in vivo expression of Helios and Foxp3 in iTreg, we stained 5C.C7 for the two transcription factors between 1 and 21 d after injection of peptide (Fig. 4). We found that i.v. 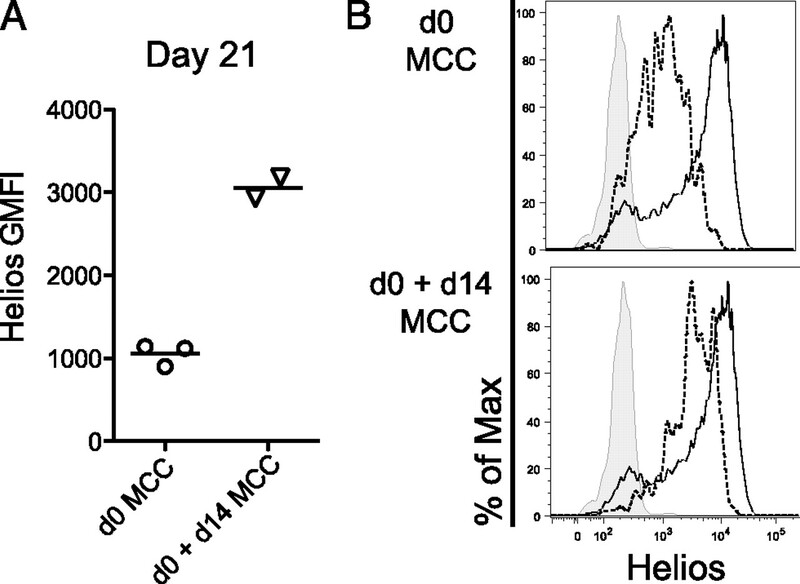 injection of MCC resulted in Helios upregulation in 5C.C7 T cells as early as 1 d after stimulation, with roughly half expressing Helios by day 2 (Fig. 4A, 4B). This was in contrast to Foxp3 expression, which was not apparent until later time points and gradually increased over the 3 wk of the time course. Interestingly, between days 4 and 21, the loss of cells within the Helios+Foxp3− quadrant corresponds with the gain of Helios+Foxp3+ 5C.C7 (Fig. 4A). This may suggest that Helios expression precedes Foxp3 expression within the same population of cells or alternatively that there is selective loss of the Helios+Foxp3− population, which would be consistent with a general loss of the Foxp3− compartment, as we described previously (20). Kinetic analysis of in vivo Helios expression in iTreg. Adoptively transferred 5C.C7 RAG2−/− T cells were analyzed for expression of Foxp3 and Helios at varying time points after i.v. injection of low-dose MCC peptide. A, Representative flow plots are shown for the indicated days after peptide injection. The percentage of 5C.C7 T cells expressing Foxp3 or Helios (B) and the geometric mean fluorescence intensity (GMFI) for Foxp3 or Helios in the induced Foxp3+ 5C.C7 (C) are shown throughout the time course. Error bars represent SEM with two mice per group. Data are representative of two independent experiments. To assess the stability of Helios expression in iTreg induced in vivo, we analyzed the mean fluorescence intensity of Helios in Foxp3+ 5C.C7 over time. At all time points where a significant proportion of the adoptively transferred cells expressed Foxp3, this population contained higher levels of Helios than the Foxp3−Helios+ cells (Fig. 4A). However, despite increasing or stable levels of Foxp3 expression, between days 9 and 21, there was a decrease in the mean intensity of Helios expression in the Foxp3+ 5C.C7 (Fig. 4A, 4C). Our previous work suggested that a significant amount of i.v. injected peptide is cleared within 2 d (20). Thus, we expected that this apparent decrease in Helios protein levels at the latest time point likely resulted from lack of continued TCR ligation. This would be consistent with the correlation between Helios expression and markers of T cell activation and with decreased Helios expression in Treg cultured ex vivo in the absence of TCR stimulation (18). To test this, in some experiments, we administered a second injection of MCC peptide, given 2 wk after the initial in vivo stimulation. This second dose of peptide resulted in higher Helios expression at day 21 (Fig. 5A, 5B). These data suggest that Treg may require frequent TCR stimulation and/or Ag-specific interactions with APC to maintain Helios expression. Continued Ag-dependent stimulation is required for maintenance of Helios expression in vivo. Adoptively transferred 5C.C7 T cells were stimulated in vivo with either a single injection of low-dose MCC peptide at day 0 or with day 0 stimulation and an additional injection of MCC 14 d later, as indicated. At day 21, 5C.C7 T cells were analyzed for expression of Foxp3 and Helios. A, The geometric mean fluorescence intensity (GMFI) of Helios in Foxp3+ 5C.C7 from one experiment is shown beside B, Representative histograms of Helios expression in induced Foxp3+ 5C.C7 T cells (dashed line), in endogenous Foxp3+ CD4 T cells (solid line), or in total 5C.C7 from nonstimulated mice (shaded histogram). Data are representative of two independent experiments. In summary, we have demonstrated expression of Helios in Foxp3+ iTreg induced in vivo. Our in vitro data suggest that the presence of APC is important for Helios expression, whereas our in vivo time-course experiments suggest that levels of Helios expression in iTreg may be less stable than Foxp3, because Helios seems to require more frequent stimulation. Our data are not inconsistent with the possibility that iTreg induced under certain conditions lack Helios. However, we observe robust expression of Helios in iTreg, which should preclude its use as a marker for thymic Treg. The absence of a marker to distinguish iTreg from thymic-derived Treg has made it difficult to assess the role of peripheral Foxp3 induction in maintenance of homeostasis and during physiological immune responses. Several lines of evidence suggested that the Ikaros transcription factor family member Helios may be such a marker, with its expression in being restricted to Treg of thymic origin (5). However, more recent work has demonstrated that Helios expression may in fact reflect recent T cell activation; in both Foxp3+ and Foxp3− T cells, Helios expression correlated with markers of Ag experience and proliferation (18). In this article, we report robust Helios expression in iTreg induced both in vitro and in vivo, definitively precluding its use to distinguish thymic Treg from those induced in the periphery. Expression of Helios in iTreg induced in vitro has been reported to vary based on the method of activation (5, 18, 19). We found that TCR stimulation with either peptide or anti-CD3 could induce Helios-expressing iTreg so long as APC were present in the cultures. These data show that the requirements for upregulation of Foxp3 and Helios in vitro are distinct and suggest that one or more APC-derived stimuli are important for expression of Helios, independent of Foxp3 induction. Thus, expression of Helios in Treg could be influenced by the phenotype and function of the stimulating APC. Upon assessing in vivo iTreg, we found that a single low dose of MCC peptide administered i.v. was sufficient to induce both Foxp3 and Helios expression in a population of adoptively transferred 5C.C7 T cells. Differences in APC phenotype and function, and the potential importance of these for the expression of Helios in iTreg, may reconcile our in vivo observations with the lack of Helios expression observed in iTreg induced by oral administration of Ag (5). The specialized APC known to induce Foxp3 in the intestine and MLN express unique surface and secreted proteins (26). Mucosal APC responding to oral Ag and the APC inducing Foxp3 following i.v. injection of peptide could differ in their ability to trigger Helios expression. This would be consistent with enhanced Helios expression in the presence of APC in vitro, independent of the minimal stimuli required for Foxp3 induction. Thus, our data are not inconsistent with the possibility that Helios−Foxp3+ iTreg exist in wild-type mice but also demonstrate that iTreg may express Helios. A recent report demonstrated that Helios expression correlated with markers of activation, independent of Foxp3 induction (18). By using an Ag-specific stimulation, we were able to characterize the kinetics of Helios expression in vivo. Helios upregulation was very rapid and peaked at 9 d after peptide injection, at which point levels began to decrease in both the Foxp3+ and Foxp3− compartments (Fig. 4). Of note, Helios expression was higher in the Foxp3+ compartment at all time points, consistent with evidence that Foxp3 may play a role in Helios regulation (15, 16). A second dose of peptide resulted in increased levels of Helios at later time points, suggesting that frequent TCR stimulation may be important for maintenance of Helios expression (Fig. 5). The possibility that Treg in wild-type mice receive frequent stimulation is consistent with evidence for Treg expression of self-reactive TCR (27, 28). Thus, it is interesting to speculate that Treg with lower levels of Helios may have been stimulated less recently. This would be consistent with the highest levels of Helios expression in the thymus, where cells have just been selected, and with loss of Helios in thymic Treg cultured ex vivo without TCR stimulation (18). In this scenario, cells with decreased Helios expression could include iTreg whose Ag was only transiently encountered but could also include thymic Treg that have not recently been stimulated in the periphery. In conclusion, the robust expression of Helios in iTreg induced in vivo should preclude its use as a marker of thymic Treg. However, the lack of Helios expression by some Treg in the periphery may still distinguish a subset of cells that differ in their stimulation history, either by temporal proximity or the type of APC. Thus, it remains of interest to better understand the regulation of Helios in vivo and to investigate phenotype and function of Helios-Treg. We thank A. Trumble-Koncelik for technical assistance and T. Simpson for helpful discussion and critical reading of the manuscript. R.A.G. was a predoctoral fellow of the Cancer Research Institute. J.P.A. is an investigator of the Howard Hughes Medical Institute.
. 2007. Foxp3 in control of the regulatory T cell lineage. Nat. Immunol. 8: 457–462.
. 2005. Ikaros-family proteins: in search of molecular functions during lymphocyte development. Curr. Top. Microbiol. Immunol. 290: 29–47. 2010. Ikaros in immune receptor signaling, lymphocyte differentiation, and function. FEBS Lett. 584: 4910–4914.
. 1998. Helios, a novel dimerization partner of Ikaros expressed in the earliest hematopoietic progenitors. Curr. Biol. 8: 508–515.
. 1998. Helios, a T cell-restricted Ikaros family member that quantitatively associates with Ikaros at centromeric heterochromatin. Genes Dev. 12: 782–796.
. 2007. Predominant interaction of both Ikaros and Helios with the NuRD complex in immature thymocytes. J. Biol. Chem. 282: 30227–30238.
. 2009. Cutting edge: Ikaros is a regulator of Th2 cell differentiation. J. Immunol. 182: 741–745.
. 2010. Ikaros silences T-bet expression and interferon-gamma production during T helper 2 differentiation. J. Biol. Chem. 285: 2545–2553.
. 2009. Ikaros is a regulator of Il10 expression in CD4+ T cells. J. Immunol. 183: 5518–5525.
. 2010. A role for the transcription factor Helios in human CD4+CD25+ regulatory T cells. Mol. Immunol. 47: 1595–1600.
. 2007. Foxp3 transcription-factor-dependent and -independent regulation of the regulatory T cell transcriptional signature. Immunity 27: 786–800.
. 2011. Helios is associated with CD4 T cells differentiating to T helper 2 and follicular helper T cells in vivo independently of Foxp3 expression. PLoS ONE 6: e20731.
. 2011. Helios expression is a marker of T cell activation and proliferation. PLoS ONE 6: e24226.
. 2010. Comment on “Expression of Helios, an Ikaros transcription factor family member, differentiates thymic-derived from peripherally induced Foxp3+ T regulatory cells.” J. Immunol. 185: 7129, author reply 7130.
. 2010. 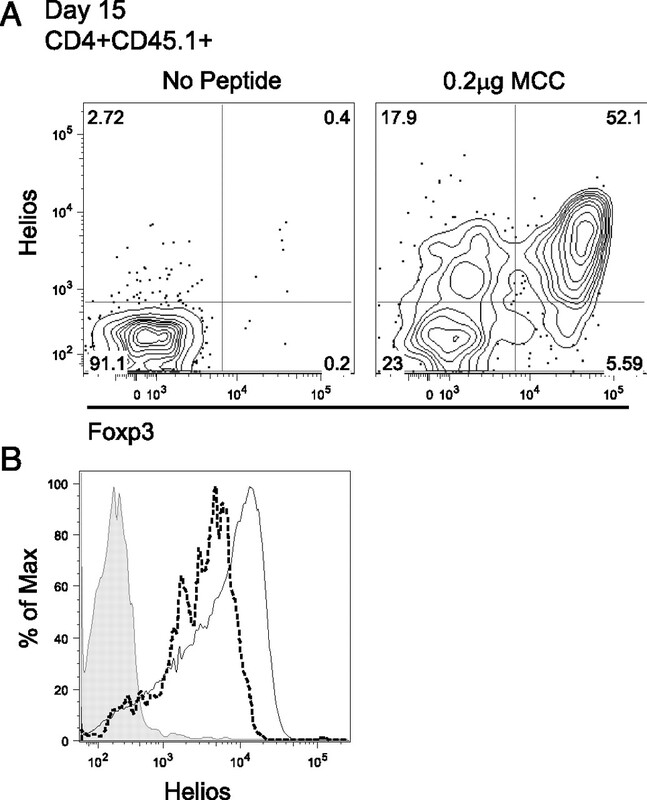 TCR ligand density and affinity determine peripheral induction of Foxp3 in vivo. J. Exp. Med. 207: 1701–1711.
. 2003. Conversion of peripheral CD4+CD25– naive T cells to CD4+CD25+ regulatory T cells by TGF-β induction of transcription factor Foxp3. J. Exp. Med. 198: 1875–1886.
. 2004. Natural and induced CD4+CD25+ cells educate CD4+CD25– cells to develop suppressive activity: the role of IL-2, TGF-β, and IL-10. J. Immunol. 172: 5213–5221.
. 2007. Cutting edge: IL-2 is essential for TGF-β–mediated induction of Foxp3+ T regulatory cells. J. Immunol. 178: 4022–4026.
. 1998. Ligand recognition by αβ T cell receptors. Annu. Rev. Immunol. 16: 523–544.
. 2004. Recognition of the peripheral self by naturally arising CD25+CD4+ T cell receptors. Immunity 21: 267–277.
. 2006. An intersection between the self-reactive regulatory and nonregulatory T cell receptor repertoires. Nat. Immunol. 7: 401–410.